Whizz the white chocolate chunk cookies in a food processor until finely crushed, then mix with 50g melted and cooled unsalted butter. 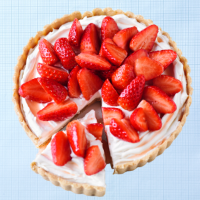 Press evenly into the base and sides of a deep 20cm loose-bottomed tart tin and chill for 15 minutes. Toss 400g hulled and halved strawberries with 3 tbsp of elderflower cordial. Beat another 6-8 tbsp cordial into 500g mascarpone, then spoon into the base. Top with the strawberries and chill for at least 10 minutes.